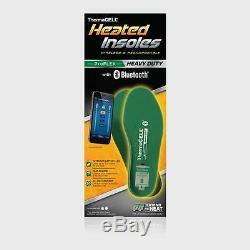 ThermaCELL® ProFLEX Heavy Duty Heated Insoles is the next generation of foot warming comfort. 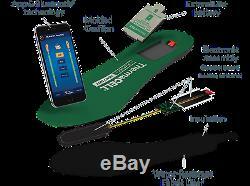 These revolutionary insoles provide warmth at the touch of a button from your smartphone! With extended battery life, fast charging capabilities and rugged durability - this product can help you take on the most extreme environments. The ProFLEX Heavy Duty insoles boast all of the features of the standard ProFLEX version, along with these great additional features. BLUETOOTH® OPERATION - No more need for that small remote! 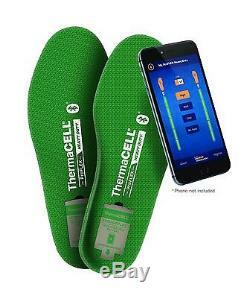 Simply operate your ThermaCELL® ProFLEX Heavy Duty Heated Insoles from your smartphone (iOS and Android devices). LONGER BATTERY LIFE - High capacity battery is 30% more powerful than the standard ProFLEX, and will last up to 8.5 hours of warmth per charge. QUICK CHARGE - Two removable cushioned batteries will charge in two hours or less. LONG-LASTING DURABILITY - Made with even more durable materials to withstand all-day pounding. New optimized cushioning and stability will help you stay on your feet all day long. Tested to 1 million steps. Package includes: 2 ProFLEX Heavy Duty Heated Insoles, 2 rechargeable lithium-ion polymer batteries; 1 smart charging case, 1 wall charger, 1 USB cable; 1 drawstring travel bag, 1 instruction booklet. Customizable Sizes for Men and Women: Fits mens shoe sizes 3.5-13 and womens shoe sizes 4.5-14. Keeps feet warm, not hot. Quick-charge technology recharges in 2 hours using wall charger or any USB port. Recharges well over 500 times. 3 Temperature settings: Low=100°, Medium=110°, and High=115°. Operated via an application on your smart device (iOS or Android) see list for compatible devices. High capacity battery - charge lasts up to 8.5 hours of constant use (on low heat setting). Powered by rechargeable, removable lithium-ion polymer batteries. Antimicrobial, shock-absorbing Poron cushion battery cover. Can be trimmed to fit almost any shoe size. Fit easily into your shoes or boots. Batteries easy to change without removing insole from shoe or boot. Tested by SATRA, worldwide leader in footwear testing, research, and development. Fits Men's Shoe Size. Fits Women's Shoe Size. The item "Thermacell Heated Insole ProFlex Heavy Duty BlueTooth Battery Powered Insole" is in sale since Friday, August 11, 2017. This item is in the category "Sporting Goods\Winter Sports\Accessories\Hand & Foot Warmers". The seller is "papaswarehouse" and is located in Vista, California. This item can be shipped to United States.